BUTTING has been manufacturing high-quality, longitudinally welded pipes from stainless-steels. For more than 235 years, the company has focused on forming, welding, machining and materials technologies, as well as quality assurance. Since 1978, BUTTING has been a successful supplier of special pipes for onshore, offshore and subsea projects in the oil and gas industry. The company produces line pipes, flowlines, riser pipes and others for topsides (platform FBSO). At BUTTING, the entire material-range is processed, particularly duplex, superduplex, nickel-based alloy and clad materials. 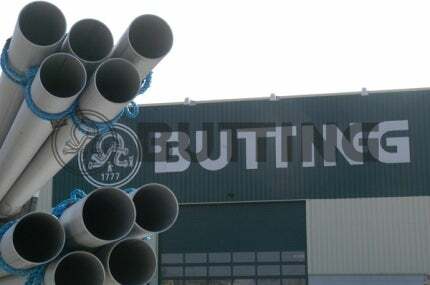 BUTTING developed a mechanically bonded BUTTING-Bimetal-pipe (BuBi® pipe) at the start of the 1990s, in order to increase the already known advantages of a clad pipe. The BuBi® pipe consists of a corrosion-resisting BUTTING pipe, which is telescopically aligned inside a pipe in carbon-manganese material. The tight bonding between the two pipes is achieved by hydraulic expansion. The producible size range comprises pipes with outside diameters (ODs) from 114.3 mm (4 in) to 660 mm (26 in) and lengths up to 12 m without circumferential weld. The innovative BuBi® pipe offers a wide range of cost-effective material combinations for both the inner and outer pipe, which proved successful in many applications, in comparison with the metallurgically clad pipe. This price advantage is due to the use of low-cost carbon steels in conjunction with corrosion resisting steels and an economic production process. BUTTING has been creating metallurgically clad plates, which are made using a special process to guarantee a tight bonding between the different materials, for renowned oil and gas companies worldwide since the mid-1980s. The company produces ODs from 114.3 mm (6 in) up to 1,219 mm (48 in) in various material combinations. Pipes can be supplied with either an external or internal cladding. BUTTING manufactures clad spools and pipes with limited tolerances on shapes and positions. The production of high-quality, longitudinally welded pipes has been the focal point of BUTTING since the initial development of stainless-steels. Few companies in Europe can point to such long-standing experience and diversity in the production of stainless-steel pipes. BUTTING’s knowledge in forming, welding and materials technology and the quality assurance is proof that the company can satisfy requirements from all industries. Longitudinally welded pipes with wall thicknesses up to 70mm, lengths up to 24m and a maximum OD of 3,000mm can be produced from individual plates on BUTTING’s state-of-the-art production facilities with no outsourcing of individual production steps. The production of stainless-steel pipes has always been BUTTING’s core business. The company also offers extensive prefabrication of stainless-steel pipelines according to models, isometric drawings and piping plans. Using comprehensive prefabrication and advanced processing of the pipe at the BUTTING’s facilities, the quality of pipelines is optimised and products ready for installation are available at reasonable prices. Pipes and fittings in stainless-steels are always subjected to a full body pickling. This ensures the cleanliness of the goods and the formation of passive layer protecting against corrosion, also in inaccessible areas. BUTTING has been processing clad materials into spools, pipes and components for more than 30 years. The company is the only pipe manufacturer in the world that produces both longitudinally welded, metallurgically clad and mechanically lined pipes. In 2014, BUTTING has processed more than 80,000 tonnes of stainless-steels. As well as the company headquarters in Knesebeck, Germany, it has locations in Schwedt (Germany), Tieling (China), Calgary (Canada) and Araquari (Brazil). The North Caspian Sea Production SPSA Consortium developing the Kashagan oil field in the Caspian Sea recently gave BUTTING an order to deliver clad pipes. Subsea 7 and BUTTING recently concluded a framework agreement on the supply of clad, mechanically lined clad, duplex and superduplex pipes. Joseph Leroy, supply chain management vice-president of Subsea 7, and Hermann Butting, sole owner of BUTTING, signed the agreement for an initial term of three years. Butting Brasil Soluções em Tubos Especiais Ltda.